To help California attorneys meet the state’s new fingerprinting and background check requirements, the NNA is now offering mobile Live Scan services that can take fingerprints at law offices with 20 or more attorneys in one location. Under a California State Bar rule that took effect June 1, active attorneys licensed in the state must submit fingerprints taken by a Live Scan vendor for a background check no later than April 30, 2019. If you’re an attorney and a Notary, you’ll need to do two separate Live Scan submissions to meet state requirements. 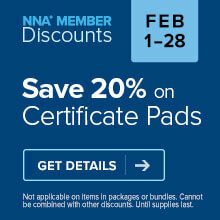 The NNA is offering a discount for customers who need both. For the convenience of law office with large numbers of attorneys in need of fingerprinting, the NNA can send a mobile Live Scan operator to perform fingerprinting services at your office. Onsite services are available for locations with at least 20 individuals requiring fingerprinting. For more information, please call the NNA at 1-855-215-2160. The NNA will also be offering Live Scan services at various locations throughout California in 2018. Lawyers can check the list of NNA California Live Scan dates locations and dates for a convenient time and place to make a Live Scan appointment. Attorneys may use the NNA’s services or any other certified Live Scan vendor in the state; for example, attorneys working for a government agency can use their agency’s internal Live Scan services, or fingerprints may be taken at a courthouse if a Live Scan vendor is available. Attorneys will need to present valid photo ID to the Live Scan technician at the appointment — expired IDs will not be accepted.